Shakla's Sudden Impact was allowed to start the Compiegne, France, 160-kilometer CEI despite his thin body condition. He was vetted out at the second gate for lameness. Organizers of the Alltech FEI World Equestrian Games have begun to plan for measures to prevent horse abuse and rules violations during the endurance race this August in France, as concerns mount within the French endurance community about the prospects of a scandal-free championship. In a frank interview with French media, Dupuille responded to new allegations from leading French endurance veterinarians and called out the United Arab Emirates and Bahrainian squads as having a large number of horses eliminated for lameness or metabolic problems at Compiegne, May 23-25. 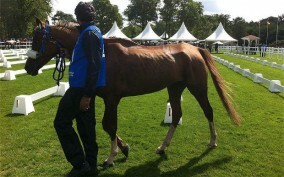 Three of the five yellow cards issued at Compiegne went to Middle East riders for “maltreatment” or “abuse” of horses. Dupuille says that at Sartilly, which takes place Aug. 28, national squads will be limited to five riders. “There will be fewer Gulf riders, and so they will be less tempted to indulge in the hellish chase they did at Compiegne,” he said. Last week, the Fédération Equestre Internationale passed emergency new endurance rules, effective Aug. 1. But the following day, five French veterinarians published an open letter (see below) criticizing the hard riding mentality of Middle Eastern riders and questioning the true commitment of the FEI to reform the sport. One of the signatories is Jean-Louis Leclerc, a hugely respected figure and member of the FEI Endurance Strategic Planning Group that formulated the new endurance rules. The veterinarians warn that the “excesses” of Middle East endurance are now evident in Europe. They allege advanced doping techniques may be masking indicators of fatigue and lameness, and that too many horses at Compiegne required post-race treatment for high heart rates and states of dehydration. Other controversies from Compiegne rumble on. Pictures of a “skeletal” Bahraini horse Shakla’s Sudden Impact caused outcry on social media. News later emerged that a UAE horse died. In the space of 10 days L Emirati di Gallura started a ride in Italy that was abandoned at Gate 1, was purchased by a European representative of Sheikh Mohammed Al Maktoum, shipped to England, then back to France to compete in the Compiegne 160-kilometer race under a strange rider, and later died of neurological problems having collapsed after the finish. “It is with great fatigue, questions and bitterness that we completed our veterinary work at the last weekend of endurance in Compiègne on May 23-25. All seemed to appear in good condition on the surface: a website and superb facilities and organization, with a group of experienced horses of a high level, a jury and a team of experienced vets. Some people have expressed their opinion about this competition; some of their words may seem hasty or uninformed. As official veterinarians, we must explain our feelings about these events if we want to continue to participate in endurance riding in the 21st century. Thus, we have seen a wave of horses going at full pace on difficult, rolling terrain in two CEIs. The late entry of many competitors had resulted in a deficit of judges, veterinarians and seasoned commissioners whether in the areas of grooming or along the route. Judges and veterinary teams organized themselves as best they could to allow for this influx. They worked constantly under pressure from some competitors dealing with cheating and making challenging judgments. Then the treatment team had to deal with too many horses eliminated for metabolic reason with high heart rates and states of dehydration that were surprising given the mild weather of the weekend. Our analysis of the causes is: Endurance as practiced in some countries in Group VII has nothing to do with the original spirit of sport. It is no longer the “race horse” where we continue to listen and strain to achieve the maximum performance that a rider can give his mount, but “endurance full on” with only the best [horses] that day supporting this violent effort. This behavior makes it seem that the rules and the concept of the vet gate do not seem appropriate or adequate to ensure the safety of the horses. Veterinary attention of the jury, however, allows us to stop these tired horses that have raced at high speed. The painstaking and careful work of the treating veterinarians allowed them to treat and handle a large number of horses in the hospital. The majority of horses treated quickly recovered thanks to the attentive care of their riders and their support team. Some, pushed too far, probably required longer and more intensive treatments, among them a horse with a neurological syndrome on arrival at vet gate, which could not be saved despite immediate treatment. Despite the sadness and tension that still surrounds the death of a horse, it is not in response to this tragic event that made us write this today. Our love and respect for the horse, our taste for endurance sport, and our deep conviction as one of the major guarantors of the welfare of the horse, pushes us to express our concern at certain regrettable excesses that we had not seen in the European endurance until recently. While some remember that endurance had known, in its early years, accidents and some deaths, probably preventable, the many veterinary checks and vet gates have been refined through studies conducted by our profession, attentive monitoring by riders and knowledgeable teams, allowed us to compete in safe conditions, at least in the European landscape of endurance riding. Responsibility for the health and welfare of endurance horses that race is not based on the vet, the judge and the jury although it could be perfected in content and especially in its application. Thus, it is impossible for us to know if the horse has received a proper diet, or has received the necessary training for the level of the test, if it is watered properly at the vet gate or assistance point or has shown signs of fatigue, diarrhea or other more subtle abnormalities. It is always the rider and his team that know the horse and are totally tuned in to its needs. In the opposite case, you may be asking too much and hit a breaking point. Thus, participants must take the responsibility of their actions and take the consequences. The context of professional riders and the recent emergence of “jockeys” who ride a horse for which they have not been responsible for the training nor the diet, not to mention “principles” more or less worthy of some stables, is not conducive to the harmonious relation between rider and endurance horse. This practice of riding a horse at short notice, even if it is common in [Thoroughbred] horse racing, is harmful in endurance. Nothing replaces listening to the horse even when we do not know it. Fatigue feels and forces the rider to react. The support team watches for signs and must recognize whatever the horse, although this detection may be difficult. In this context, as practitioners and scientists we are also faced with a situation that greatly complicates the assessment of locomotion and metabolic signs in the endurance horse: Unfortunately the development of doping techniques can significantly disrupt conventional signs of fatigue that would normally alert us, so much so, that these practices will allow unsportsmanlike people with tired horses to stand at the vet gate with seemingly good reviews to even the most seasoned vet who must judge in a minimum time on a small number of clinical criteria. Veterinary checks, as they were originally designed, assumed perfect cooperation between a rider/coach who knew his horse, and a vet who brought an exterior and scientific eye on the state of fatigue in the horse. But now we have to make decisions about horses whose riders barely know them, and where concealment, cheating and deceit are a mode of operation. Under these conditions the endurance we call “modern” no longer ensures the safety of horses and we, in the veterinary field, deplore this state of affairs and the total ineffectiveness or lack of real commitment from the FEI to solve this problem. These horses are put in grave danger by these cheating practices, which are unacceptable to us, as they are for any participant in these races, and we deplore this situation as it makes us cynical about the sport. They go completely against the spirit of sport and must be combated with pugnacity. Unfortunately, the complexity of detecting certain substances and cost make this prevention difficult. It does not take much to be defeatist or to leave the field open to those who are responsible for endangering these generous and exceptional horses, just for their own pride. Monitoring the training, especially during the race, is also very complex due to the great difficulty of finding enough judges, (FEI approved), a competent authority who is incorruptible, and, in addition, volunteers. Witnesses outside the world of endurance are so desirable because they come back and give objectivity to situations of abuse and can be better controlled or prevented. In conclusion, recognizing the key role that veterinarians have to safeguard the well-being of endurance horses, we also call on other players in the world of the horse to help us in this task: the riders for their vigilance and to ethically care for their horses, animal welfare people to be attentive witnesses at competitions, and national and international organizations to ensure the implementation of strong measures to prevent abuse, especially regarding doping. We realize that none of us can achieve this alone to save the sport from the failure in ethics that we have recently felt, and it is only by tightening our practices, we can continue to practice in respect of horse. —Veterinarians Christophe Pelissier, Romantzoff Pierre, Antoine Seguin, Jean-Louis Leclerc and Benamou Agnes Smith.